With Muddy Plimsolls, it’s easy to find a personal trainer who offers a great experience and guaranteed results either outdoors, at home or in a dedicated space at work. Our team of fitness professionals are dedicated to getting you into the best shape of your life. All of us have the experience and the love of training outdoors. Whether it’s weight loss, strength training, cardiovascular fitness, or increasing your energy levels, we’ve got the training programme for you. Muddy Plimsolls was created in 2008 by experienced personal trainer Jason Doggett. The aim was to offer the opportunity to enjoy the benefits of outdoor or at-home training along with our superb customer service, convenient online billing and the most professional and reliable personal trainers in London. Below you’ll find a selection of our top personal trainers and a little bio about them. We’re adding new members to our team all the time, meaning we offer new skills and new locations. Just ask and let us find a personal trainer that suits your personality. George – mixing Crossfit principles & sound nutritional advice, George produces great results. A Birkbeck post-grad in Psychotherapy, he introduces sustainable changes to your current health regime. Jeremy – whether working with elite cyclists or a 70 yr-old grandmother, Jeremy adds a sense of play within his sessions. Has worked successfully on clients with a variety of issues from wrist RSI to hip surgery. Danny – former Team GB international hurdler, Danny takes a very structured and planned approach, training clients at a level they can manage but will still see them achieve great results. Emma – Sports Science grad, Cancer & Exercise Rehabilitation qualified. Practised in complex health concerns/co-morbidities via ‘adult weight management’ programme. Loves hill sprints, kettlebells, HITT. Kate – a double British Olympian and Commonwealth games swimmer. A disciplined and technical approach to sports specific training combined with a friendly attitude. Matthew – an expert in counting carbohydrates, sports nutrition for long distance sports events. Plus, a black belt when a teenager. No-nonsense training from a patient and understanding trainer. Sylvia – a former strength & conditioning coach for college basketball, Sylvia is also a British Powerlifting Federation member, and has competed at the Women’s British Classic Championships. Jason – believes fitness should inspire self-belief to achieve more. Has skied Vasaloppet 90km race & run the 260-mile Pennine Way. Saw Gulf deployment as a 131 Independent Commando Squadron reserve. Samantha – holds an Msc from London School of Economics. She has trained in Muay Thai in Thailand and has a love of kettlebells, outdoor swimming and the good old fashioned skipping rope. Paulina – Paulina is a member of the Hampstead Triathlon Club. She holds separate qualifications in Kettlebells, Indoor Cycling, GP Referral Certification and Suspension Training. 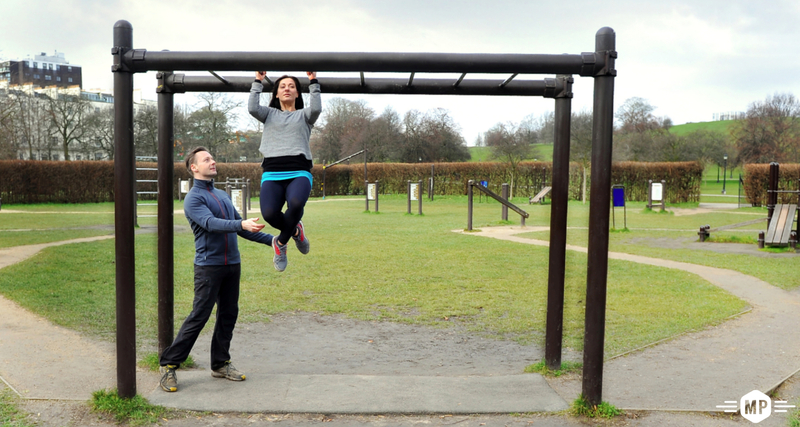 Katie – an Outdoor Fitness qualification from Train Fitness, allowing her to train clients referred by medical professionals in the UK and EU. Coaches at Magdelen Tennis Club. Megan– a dedicated fitness competitor which includes half-marathons, cycling, triathlons & military-style obstacle races. Embraces the occasional muddiness of outdoor fitness. Toby – CrossFit-qualified instructor with a rugby background and keen interest in nutrition. Experience in hypertrophy training (muscle building) and enjoys motivating clients to push themselves. Alice – 1st class degree in Dance and former teacher at London’s Pineapple Studio. Love of gymnastics. Motivates people to rediscover the strength and beauty of their bodies. Mustafa – an outgoing Londoner from Haringey and Arsenal fan. Enjoys playing a wide range of sports. Passionate about basketball, practicing both as a coach and referee. Alison – a UK Athletics Coach in Running Fitness, with a strong focus on teaching efficient running technique to enable clients to run faster and longer than they thought possible. Louise – empowers herself with dynamic yoga and hard workouts. A foodie, passionate about eating well: healthy, clean and lean, around & about London’s restaurants. Victor – a BSc (Hons) in Psychology & Sports Studies and likes to educate his clients on the physiology of exercise as he finds that they learn a lot more about their body. Iona – blends full-body athletic training with yoga-style movement that’s demanding but achievable. An expert in building confidence to help achieve fitness & weight loss goals. Her philosophy is Train Heal Breathe. And many more! – Our team of London’s finest mobile personal trainers is always expanding, offering new locations and more availability. Please do contact us if you have any specific requirements in a trainer.